And I believe, by meeting me they have honored you and our beneficiaries for our collective efforts. I realized lately, thanks to Bicycle Angels, that the less privileged get water for all purposes, but rarely they have access to good drinking water. But Thanks to my pals Vinayak and Siddhi I realized we privileged beings can donate drinking water to those who live or work off streets when we commute. Especially when we travel daily. So I bought a water bottle today and handed it to a kid. He was a street performer and his name was Ram. He was from Phalton, Maharashtra. I hope you lovely peeps do the same, someday, and if you would like to send us a selfie with the bottle you donated, any where in the world you may be, post it in this group along with your thoughts and who you are. And now I am also a happy #WaterTaxi I hope you be one too. Water Taxi. To provide drinking water. To any one in the world. From where ever you are based. Water Taxis’ are arriving soon. A non profit social initiative by my dear pal Siddhi Sanghvi and myself. To provide drinking water to children and adults who work/live off pavements and streets. If you want to offer a bottle of drinking water, to any one any where in the world you may be, you are welcome. You could be resident anywhere in India or the world. Please inbox me for details. 152 nd recipient of help – Many of us have a hard layer, and some people, only the privileged few, get to reach our soft spots. Yunus is from Jharkhand. He lives in Bandra East, and he sells coconuts on Carter road. I met Yunus nearly a year ago, when I once happened to stop to drink coconut water at his bicycle-stall, post one of my daily south Mumbai bicycle rides. I think my rider pal Ekta was with me then, as it was her regular pit stop post her south Mumbai rides. Anyways, when I happened to stop subsequently to buy coconut water from Yunus, while I watched him swiftly slice away the hard top layers, striving to reach the inner soft spot where my thirst awaited to meet her sweet waters, I wondered. I wondered, gazing at the beautiful sweet-core coconut, that we all have a soft spot. Just like this coconut does, who was growing smaller and smaller with every swift slice of Yunus’s crafty knife. Many of us have a hard layer, and some people, only the privileged few, get to reach our soft spots. Family does, dear friends do, and best friends of course dwell deeply in our soft spots. Actors, directors, writers, musicians, composers, they too get to experience each other vulnerable soft spots easily. That is where our true selves dwell. Just like the sweet waters of this coconut, that will come rushing through her core when Yunus’s knife will eventually and finally arrive at her soft core. And sometimes we discover our own soft spots, when we meet someone far less blessed, or far less privileged, and such a person will most often be a stranger to us, and may not necessarily be someone who asks or needs our help. Yet, we may want to reach out. And most do. So, while I awaited Yunus’s knife to announce the arrival of the soft and sweet spot of the coconut expertly chosen for me, bina-malai (without cream), I studied Yunus’s old bicycle. It was completely rusted and could fall weak by the way side any day. Like old age. I looked up at the large number of coconuts his bicycle straw basket was laden with, and worried about his safety. And considering coconuts are far more heavier and bulkier to transport than milk, eggs or bread, I though it is important we ask him if he needs to buy a new bicycle. Yunus’s clothes, footwear and general appearance had already spoken to me, silently though, hinting to me he will definitely need and or appreciate our help. So I bravely ventured to ask Yunus, does he want our assistance in replacing his old bicycle with a new one. Provided, he is willing to contribute half its cost. Yunus, smiled a lot, and after a while agreed. I still do not know if he smiled because he thought I was just kidding, or was smiling recognizing good fortune at his humble door step, having arrived announced, like a welcome guest and friend. However, Yunus reverted to me for our help, a few weeks ago, nearly a year after I had approached him. He said his old bicycle frame broke into two and he has had to weld the frame to continue using it, until he can buy a new one. I know, welded frames will never last and will betray ruthlessly, like an enemy, and without warning. So, we bought him a new bicycle, and he willingly paid half its cost. Yunus has never attended school. Poverty and deprivation denied him the privilege and blessing of an education. Life has been his only Teachers. He had to toil from a very early age to support his family. They are four sisters and three brothers. The family continues to live in the village, as existence is far more cheaper and affordable there. His family owns a little amount of land, but agriculture is not enough to sustain their large family and even their basic needs. Yunus migrated to Mumbai a decade or more ago to earn a livelihood for his family. Yunus was a very positive person. He smiled a lot while speaking to me, even when he spoke about the many challenges he has faced. After we had purchased him a bicycle, I happened to stop by his bicycle-stall for a drink. He refused to accept money from me for what I had consumed. On insisting I will pay, he agreed to accept my money but offered me a Rs 10 discount. Someone may argue that I should have accepted his gratitude, and his graciousness. His offer of a free or discounted coconut. As it was his way of saying ‘thank you’ to us for having helped him, in our own tiny way. But, first of all, I was not the donor of his bike. Mr Vijay Vaid was. Secondly. I did not want him to feel he owes us anything, just because we helped him in his hour of need. He had left his ancestral village and come to the city to earn a livelihood. Why deny him even a penny when his life is far more challenging than ours. It was our way of subtly expressing to him that we do what we can do, not because we want freebies or a discount from those we manage to help in our tiny ways, nor because we want some ‘dua’/blessing, from them or from their or our God, Lord, or Prophet. Doing what we can do for others just to earn good Karma, would be selfish, indeed, and would defeat the very purpose of true charity. And thank you to Kohinoor Cycles (http://kohinoorcyclestores.blogspot.com/) Siddharth Vora (https://www.facebook.com/siddharth.vora.58?fref=ts) for the good discount and service. Devovrat Das is originally from 24 Parganas and working here in Gurgaon as a pantry boy in a pvt company. Post completing till 9th standard in West Bengal, Devovrat left his town so that he could earn something and moved to Mumbai at his uncle’s place for work. He started learning diamond cutting and got training for around 2-3 months but could not opt it as a profession, since he was a migrant and did not had any local resident proofs. He had only two options, leave Mumbai and go back to his native town or pay a significant amount to get the local proofs which was not possible as he did not had any job at that time, thus he had to come back unwillingly. After spending few months in his home town, he thought to start afresh and moved to Mundra port, Gujarat and worked in a fertilizer factory for around two years but due to health problems he left that job and came back to his home town. 2 years back, he came to Gurgaon for a better chance at earning a livelihood for his family, here also he tried various professions like gardener, newspaper vendor, store in charge etc. but all these jobs were very short tenured as he was not satisfied in any of these roles. He then finally started working as a pantry boy in a private company and is now happy in his current 9-6 job. As here he has a chance to have extra income due to overtime. Around five months ago, Devovrat got married to Phaguni, who had also moved to Gurgaon from west Bengal in search of a better living. During my conversation with them, husband and wife, I asked them if they have any plans of extending their family, having children; to which they clearly replied that they have got other liabilities for now, and till they first get free from them they will not plan to extend their family. Devovrat has a sister whom he has to get married, but before that he aims to make her independent and thus have got her aligned with a tailoring shop in the neighbourhood where she is learning tailoring. We were happy to hear that this young working couple is mature and understands their responsibilities and their liabilities. We have provided a ladies cycle to Devovrat’s wife Phaguni earlier so when I asked why he is looking for another ladies cycle than he replied if my wife cycle is broken down than she can use mine to go to her work as she has to reach her workplace at 6 in the morning or her sister can use when he is off to work. It made me wonder, less privileged people like Phaguni and Devovrat migrate from small villages to metro’s, to earn a livelihood. But, with better earnings and the better lifestyle that big cities can provide them, are these migrants really getting what they were expecting from the cities? Do cites live up to the promises they make in the minds of these migrants? It’s a new beginning for Phaguni with Devovrat. We wish them a happy married life and a safe ride for her on her new cycle. This bicycle we donated to her will help her travel faster to her place of work and keep her safer on streets. Thanks a ton to my friend Amish Gupta, who came forward willingly to finance this bicycle for Devovrat Das. 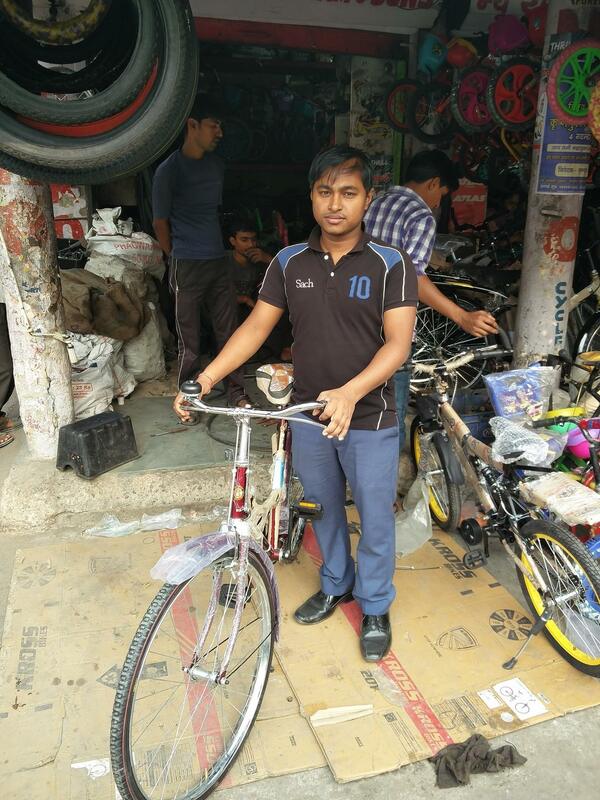 Through this humble deed I think we have added yet another member in the chain of the many donors who support Rakesh’s Bicycle Angels’ efforts to help less privileged people earn a better livelihood. Rakesh Anand Bakshi and his donors’ (of Bicycle Angels), and their good work, is behind my own motivation for helping less privileged people in and around Gurgaon. And I hope to help many others like them in future as and when I am able. National ADOPTION AWARENESS WEEK ride. 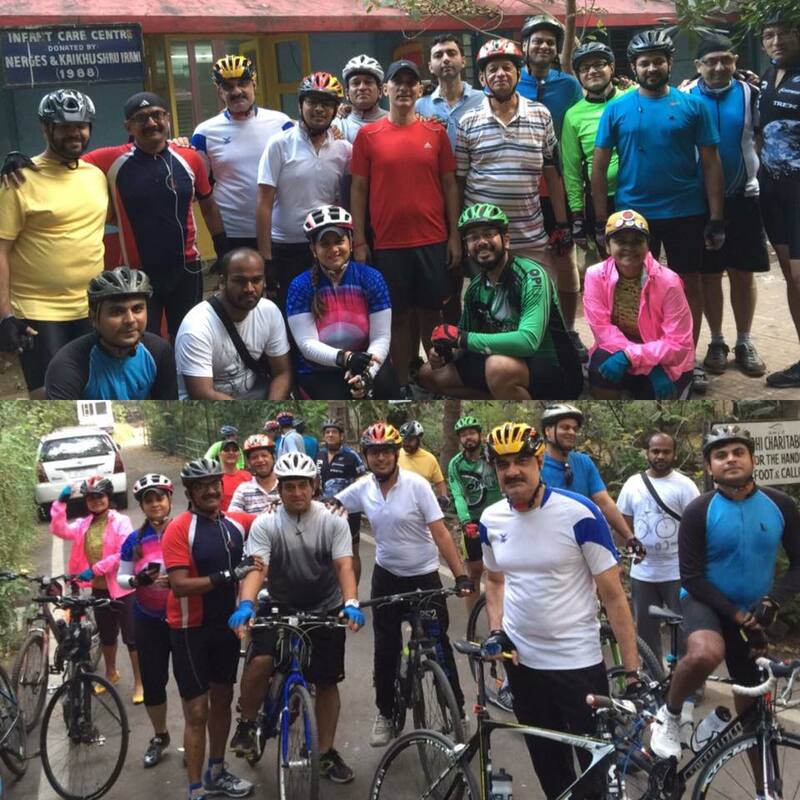 Thank you to all, including Krish Captain and #PedalBunnies, and to my friend Siddhi Sanghvi. Kishorilal is from UP. Most dhobis I have come across are from there. He lives at Parsi Dhobi Ghat, Tardeo. I met Kishorilal one early morning when I was riding past Girgaum Jain Temple. His bicycle was in a dilapidated state, so I slowed down to ride alongside and chat. His bicycle was 11 years old. I offered to buy him a new one, if he were willing to contribute half its cost. He agreed. Kishorilal reverted to me after saving nearly half the amount that was needed to buy a new bicycle. After a year almost. That, is how long it can take some people. To collect just Rs 2500-3000. Both his parents passed away, his father first, when Kishorlilal was in the twelfth standard. He could not study any further. He had to quickly begin earning a livelihood for his family, his brother and mother. He was used to working from a very young age. Even when he was in school, post school hours he would work as a daily wages agriculture worker, in the fields belonging to others. Kishorilal’s greatest challenge so far is from his childhood years. The expenses they had to bear post the death of his father. On the last rites and rituals. They had to borrow money from their relatives. Their relatives also provided them the Ghee that is needed during the funeral, as he could not afford it. Ghee! So dear and almost impossible for nearly 300 million people in India. And for peeps like a few of us, ever since I became conscious of my food intake, I have often dabbed the ghee off Jalebis, Puris and Parathas with highly absorbent tissues, and thrown the Ghee soaked tissue in the dustbin. And reprimanded my dear and fantastic cook not to use so much! A man may not be able to eat Ghee. Nor offer a teaspoon to his family to just take a whiff of, in his lifetime. Yet, on his death, rituals and traditions, and sometimes relatives compel them to say their last goodbye with revered and precious Ghee. It took me back to the funerals of my loved ones. My parents. They were moments of my own first realization of the many rituals are associated with a loved one’s last rites. They can overwhelm you. It made me realize the three most significant elements that a departed soul makes contact with are, water, fire and wood. In that order. Most often, the very first contact the departed soul makes with is water, when tear drops rain down on them from their loved ones at the realization of their loss. Then, next, it can be with water fed via Tulsi-leaves or then Ganga Jal is poured in the mouth of the departed soul. The next, Fire. An oil lamp, (preferably sesame-oil) with one wick only, or a single agarbathi (incense stick) are lit and kept near the head. Maybe it is done to send the universe a message, that we still care for the departed soul; “I will keep you warm, even though for the first time you feel so cold to my touch.” I wondered as I saw them lie as silent as I have never seen. Then the final embrace we send them is by Fire. Fire, helped by the ever-eager-to-burn-wood-chips-soaked-with-Ghee. This was the first time, for me, Ghee did not smell good. Fire destroys the last traces of us, except our footsteps and our memories of them, and the good work and good advise they leave behind. In the process, I think it teaches us detachment from their physical form. With such thoughts floating in the sky of my mind I watched speechless my loved ones drift too far away from me in overwhelming smoke. This is the only smoke that I ever experienced, twice now, from which I did not want to run far from. The attachment, with the departed soul, still remains. Physically too, as we still hold on to their ashes. And the last stage for us in their onward journey is ‘detachment’; when we sail the last boat leaving the harbor of life on the waters of the Ganges. The final frontier it is. Their soul’s eternal journey commences when we let go of their only mortal remains, ashes, that we so dearly hold on to. I had too. With such contemplation I had said my own last goodbyes to my loved ones. It was on the banks of the Ganges that I realized now they have drifted away too far for me to ever reach. I moved on. Maybe that is why some of our last rites’ rituals may have come to be. Kishorilal has 6 children. His family lives in the village. His four daughters are still in school. I prodded Kishorilal to tell me more about any other financial challenge he may have faced. He said, “After my elder brother passed away, I helped his daughter get married. They had some savings. I clubbed them with my own and paid for her wedding.” I was glad for that. 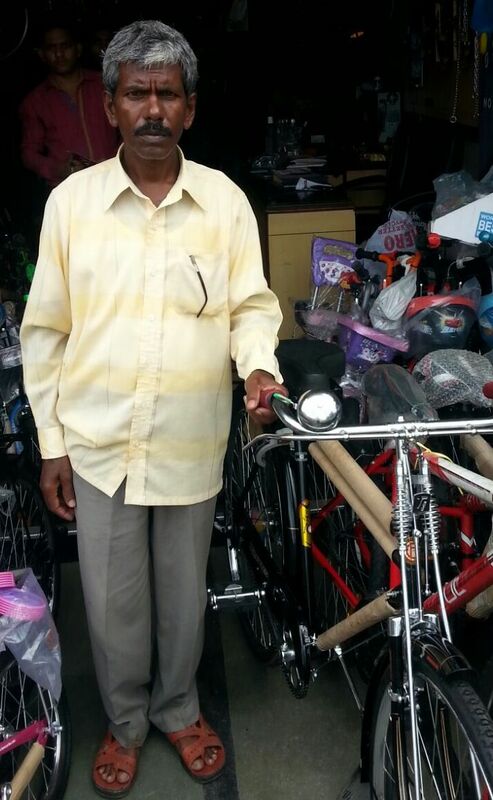 Thank you to Rana Roy, RB, and Akanksha Sarraff for buying this new bicycle for Kishorilal. He contributed nearly half its cost. Kaveri has CP (Cerebral Palsy). She has speech impediment, and cannot walk. So far, she was being carried around by her parents. Almost Everywhere. However, growing older she has already become too large, and probably too heavy too, to carry even short distances. I have friends, and even some new acquaintances, in our group who have been wanting to buy any needy person a wheelchair, which normally costs Rs 6000. However, by giving Kaveri a wheelchair, her weak legs will lose the only other opportunity they still have to work hard themselves to grow strong. By giving Kaveri a walking aid instead, that costs far less than a wheelchair, we give her legs the opportunity and chance to gradually, and eventually, get strong enough to carry her dreams on her own shoulders and two legs. And she can one day become truly independent, not needing the support of another human around her to walk towards her daily needs and even her long term goals. Kaveri’s brother is studying Hotel management. Her father is employed someplace and they live at Wadala. 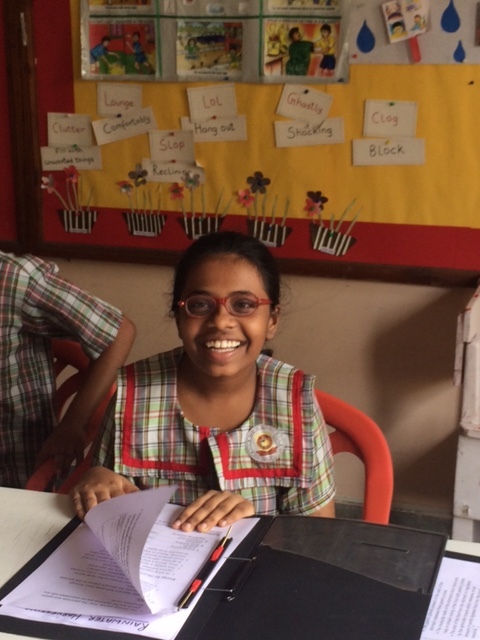 When Asha Kamble admitted her daughter Kaveri at ADAPT (school) in Bandra west eight years ago, she would wait outside the school for nearly half a day to take Kaveri back home after school. I think, it was Asha who decided on her own accord that instead of wasting her time waiting outside the school staring at life go by, she should volunteer at the school. Encouraged by the principal, she did a course in taking care of special children and then took up a volunteers’ job at ADAPT. I felt, Asha Kamble feels a deep satisfaction serving children who face challenges similar to her daughter’s. Bringing up a challenged child herself, especially a girl, she will be able to serve such children ably. Asha smiled as she said this to me. One of those that lingers especially long because it is born from a place of high self-esteem. She was proud of her decision, I felt. By being of good use to someone we can become people of great value. To ourselves too. I thought. If being of good use to others is what donors really do, for me, Asha Kamble is a donor too. Long after I left the school, I thought, Kaveri is the daughter of a woman who decided to be of good use to challenged souls. Those beyond her own challenged-soul. Because I saw two challenged souls here, Kaveri and her mother. It must be emotionally and physically draining being the mother of one. Kaveri is a teenager. In a few years she will be an adult. I asked her mother, what her dreams are for her daughter? “I want him to be able to go to the toilet on his own… She should be able to wear her underwear and other under-clothes on her own before she becomes an adult.” – I have heard this often from mothers of CP children. Yet, I cry each and every time. Thank you to Seema (Dr Satish Gupte) Shrikhande for buying this walking aid for Kaveri.